As y'all should know by now, I LOVE me some twisted fairy tales. 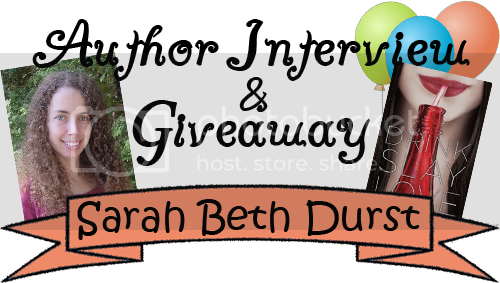 And one of the QUEENS of twisted fairy tales is the ever-lovely Sarah Beth Durst! 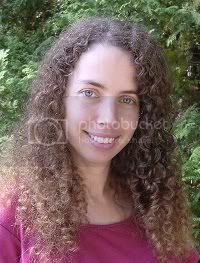 Sarah has written a boodle of fairy-tale books (Ice is my personal favorite), and this year she's stepping into the paranormal world with VAMPIRES! Was that a groan I heard? Groan not! These aren't your mama's vampires. Read on, my friends! How do you celebrate a book “birthday”? Do you have release parties? Any traditions? Every book birthday, my husband has my newest cover art framed. Kind of feels like displaying the first photo of a new baby. Except no one’s wearing diapers. Aw. He buys you book-themed jewelry AND frames your covers? You found a winner! If you could invite any person (living or dead) to your birthday, who would it be? Jim Henson (but only if he brings Kermit and a gelfling or two). Or maybe I'll just invite Kermit. But without Miss Piggy. She's too high-maintenance. So true! She would totally hog the spotlight on YOUR birthday. It seems like you’ve taken quite a leap from fairy-tales and were-tigers to vampires. Would you ever consider writing other YA genres? Maybe contemporary fiction? Dystopia? I love fantasy. All fantasy. (Dystopia counts. Ditto science fiction.) So long as there's something impossible (or even just improbable) going on, I'm in. It's just the way my brain works. I was that kid who always checked closets for entrances to Narnia and who searched her backyard for stray dragon eggs. So I can see myself writing in different subgenres of speculative fiction, but I doubt that I will ever write contemporary fiction. I'd be far, far too tempted to toss in a talking cat. Well, I'm more than happy with delving into your fantasy worlds. Speaking of, can you tell us what you’re working on now? Does it have a title? Release date? Right now, I am wrapped up in the release of DRINK, SLAY, LOVE. Book birthdays really do feel like real birthdays. You bake the metaphorical cake, put up the metaphorical streamers, and hope your friends show up! And that they like vampire-and-unicorn cake. But when I’m not obsessing about DSL, I am working on a standalone YA fantasy called VESSEL. It will be out from Simon & Schuster in fall 2012, and I’m really excited about it. Ooh, I don't think I can choose! I love the DRINK, SLAY, LOVE cover too. That drop of blood on the bottle is so perfect, especially how it touches the letters. But I love ICE too because it captures the mood so perfectly, and the polar bear and Cassie look exactly how I pictured them. And ENCHANTED IVY with the clawed hand and the just-started bird. And the cat's spurs on INTO THE WILD... The artists and designers for all of them did such a fabulous job. I feel very grateful and very lucky. I do love the Ice cover, and the simplicity of the Wild covers is brilliant. If you could trade lives for a week with one of your heroines, who would it be and why? Cassie (from ICE) with her trek across the Arctic is much more outdoorsy than I am. I am a natural coward. Plus I need to be temperature regulated. Lily (from ENCHANTED IVY), despite the bucolic Princeton setting, nearly dies too many times. Julie (from INTO THE WILD and OUT OF THE WILD) has the unenviable task of straddling the fairy tale and normal world, which isn't a comfortable situation. And Pearl (from DRINK, SLAY, LOVE) drinks blood. Ewww. One of the reasons that I love to write is that it enables me to live vicariously through my characters... without ever leaving the comfort of my own desk! Of course, if we could specify that the week we trade is after the ends of their novels, then I'd be willing to swap with any of them. After five hours of scurrying, she saw a small velvety white oak, nearly yellow against the blue-white dragon. Everlasting snow swirled like fast-moving dancers around it. The dragon raised its pumpernickel foot as she approached—it was an old dragon. He was so azure that she could see his mongoose pressing up through his fur. Poor thing, she swaggered. Look! I found a video of Sarah talking about Drink, Slay, Love! Watch it, then enter the giveaway! 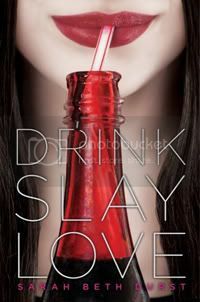 Today's giveaway is a copy of Drink, Slay, Love provided by Sarah! It's hosted by Ephrielle at Hope, Love, and Happy Endings, and you've got to go there to enter. So get going! I am SO picking up a copy of this next week! I heard Sarah read the first chapter back at World Fantasy Con last November. It was awesome! I have been waiting EVER SINCE to hear what happens next. Awesome interview and book cover! Thanks so much for the interview! I love Sarah Beth Durst's books! She has such a lovely writing style and I am looking forward to reading this book by her! Thanks again! I think this has been my favorite interview. Sarah seems like she'd be a fun friend to have! I totally love the cover too! I've seen the book cover on a couple different websites and it has piqued my interest! Can't wait to read this book! Very fun! haha. i really want to read this book! I'm Grace Radford on the google spread sheet. I haven't read anything by Sarah yet, but that doesn't mean I haven't heard good things. I'm actually very curious about this novel. Can't wait to read this one. It sounds like a lot of fun. This book sounds so FUN! I'm loving the vibe I got from the summary on Amazon. I'm ready for a vampire book that's not as... serious, I guess, as, say, Twilight. I love this cover of this book! I am really getting excited to read it. I have really been wanting to buy this one but I still have so many books that I just bought in the closeouts but this wasn't on the shelves! Yes! A gelfling to a birthday party! Just leave out those vulture guys! And I totally looked for doorways into other worlds and fantastical creatures in the woods when I was younger (and maybe I still do...). Great interview! I can't wait to read this! Every time I think I'm over vampires, a new one pulls me back in! I'm intrigued. Curse you, vampire books! I have really been wanting to read this book. Can't wait espcially after reading the interview. Great interview. I am DYING for this book! I've been seeing it everywhere and heard it's amazing. It sure SOUNDS amazing! It's my current obsession. Must. get. hands. on it! I lovelovelove the cover of this book. It is def. one of my favorites I've seen in awhile! I love me some vampires so new vampire books totally make me happy. This book sounds great can't wait to read it. thanks for the great interview. Vampires and unicorns, veryy interesting. :) I've heard a lot of good things about this book, can't wait to read! This book sounds so quirky that I cannot wait to read! Prettiest cover ever! What a fun interview and what a great personality Sarah is! I really like the cover. Really screams "Vampire Book. Come read me!" the book sounds great! And Jim Henson - how I miss him! I loved the interview! This cover is just too awesome! I really want to read this book! This book sounds fanastic! Thanks so much for a great post!